This report marks the first full month of operations for Ethfinex since the launch of the Nectar token. Although still in beta mode, with a collection of our most exciting features still to roll out, our results up until this point show that a solid foundation has been put in place for Ethfinex to grow on. As a community-run Ethereum exchange, transparency is paramount to our success and longevity. To provide our users (i.e. our owners) with the insights required to thoroughly evaluate our performance and make suggestions as to the long term development of the platform, we will be releasing monthly performance reports breaking down our revenues, user statistics and more. We welcome you to the first edition of this report. If you have suggestions for future areas of analysis, please get in touch via Telegram. We will be making platform statistics public in the next week or so, allowing users to run analysis as they see fit. Thank you all for a fantastic first month — let’s keep it going! 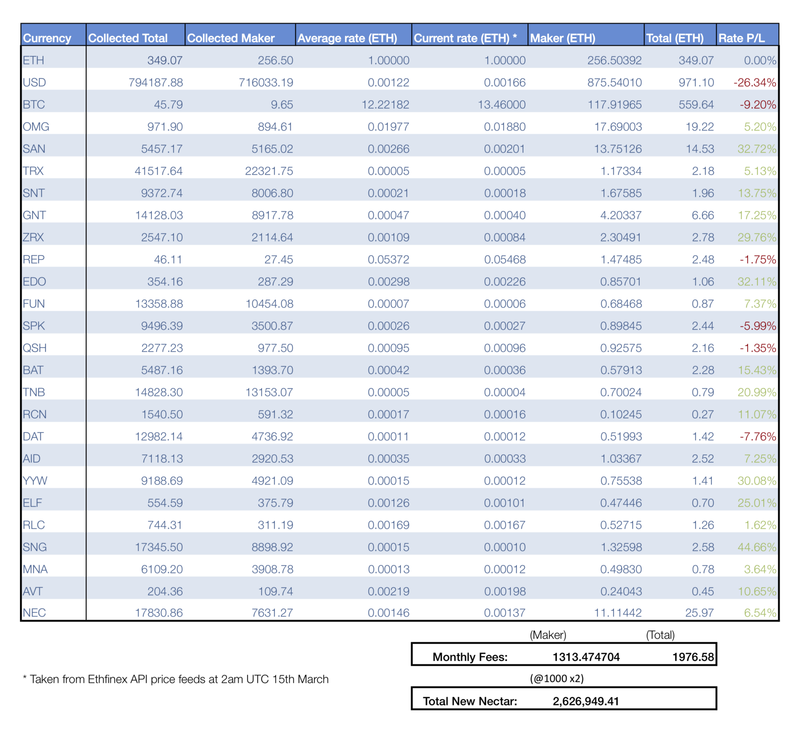 Total fees of ~$2,400,000 (depending on price feeds) were collected through trading in the 30-day period. In line with this, 1,976.58 ETH have been contributed to the Nectar token contract, pledged to holders of NEC.2,626,948 NEC tokens will be issued to reward Market Makers who were active in the month. At the time of writing, each NEC is valued at $0.71 by the market on Ethfinex. The credit of new tokens happened directly to trader’s Ethfinex accounts on the 15th March, and deposits and withdrawals are now open. Today we announce Nectar.community; an open-source governance Dapp for users to monitor Nectar earnings and vote on proposals concerning the future direction of Ethfinex. Multiple performance improvements, including improved chart styles and responsiveness of order books, and matching engine upgrade. New token proposal listing UI, for users to submit tokens to the Ethfinex discussion forums. Launch of the Nectar token (NEC) and kickstart to Market Maker Loyalty Program.New support team members hired and trained ready to begin scaling up new user acquisition in Month 2. With an aim to provide as much transparency as possible to token holders, Ethfinex intends to produce reports in as much detail showing the results of each 30 day period. This initial blog post contains only rough analysis, and will be followed by a more detailed report once there has been time to conduct a more full analysis. All fees were converted as they were collected into ETH to provide an averaged conversion cost across the month and average out the effects of price volatility during the period. The above chart shows 50% of trading fees in all currencies collected. 1976.58 ETH were collected during the month and pledged to NEC token holders. Note that fees cannot be extrapolated to trading volume directly as users can set their preferred fee currency (hence the popularity of BTC and USD). 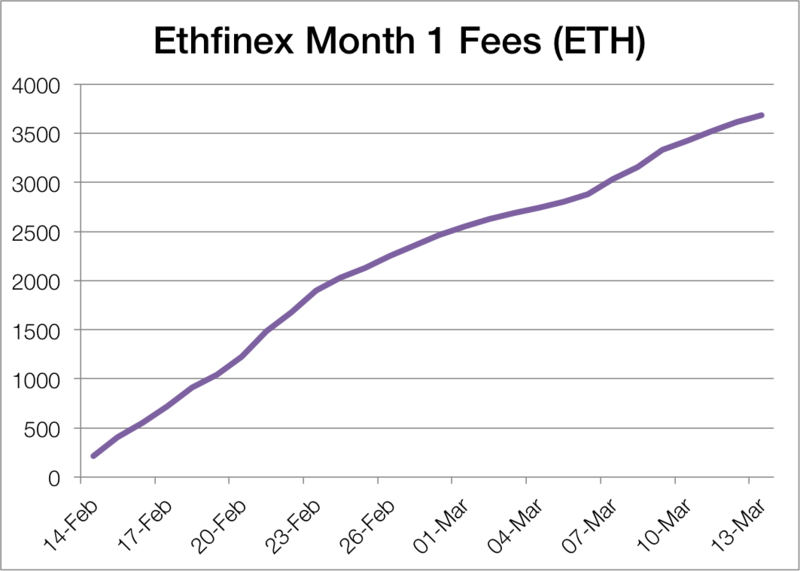 The effective fees, in ETH equivalent, grew at a steady rate throughout the month. This was against a backdrop of falling markets across the entire cryptocurrency ecosystem, with ETH value hit particularly hard towards the end of the month. In future months we will be providing more in depth analysis of trading volume changes, comparisons month-on-month of trading-pair patterns and growth, new users and new token listings. However since this was the first full month of Ethfinex and Nectar meaningful statistics are not yet available. Ethfinex will push forward on shifting governance decisions to be made by NEC holders. This will involve starting the first token holder votes on nectar.community offering the choice to refine anything from the Ethfinex fee structure, the Nectar token model and the token listing process. The fundamental development of Ethfinex as the home of Ethereum trading will largely coincide with the removal, or lowering, of the 10k USD minimum equity required to trade on Ethfinex. We now feel adequately prepared for this removal following the development of an agile, proactive support team to assist our growing user base. This requirement was put in place to curtail the influx of new users whilst our support & compliance teams scaled up, and not to position Ethfinex as an “exclusive trading hub”. It is absolutely essential for us to cement this point, as the entire vision of Ethfinex revolves around acting as a vehicle for users to enter the Ethereum community. A core component of our focus now revolves around improved identity verification for our users. The current verification process on Ethfinex can take 4–6 weeks to finish, which is unacceptable for an exchange accepting new users. A core aim for us as we approach the end of the Ethfinex beta will be to decrease verification waiting times by a factor of 100 whilst remaining an entirely compliant exchange. Development efforts for the UI will go towards offering a simpler core Ethfinex trading UI, facilitating the entry of newer, less sophisticated traders. The current UI is based on Bitfinex’s UI which is targeted at professional traders and provides access to the most advanced order types, margin trading, and charting. We have deemed that only a fraction of these features benefit the majority of traders and we have chosen to simplify certain aspects to better facilitate the experience of mainstream traders. Our decentralised trading portal will allow for non-custodial, Ethereum-based trading via MetaMask and Ledger. This portal is currently going through integration and final style changes to simplify user experience, but is set for launch shortly.The Ethfinex gateway API will allow users to submit orders in the 0x format, subsequently allowing anyone to create their own UI (e.g. a ShapeShift style interface) to interact with the Ethfinex order books. All this can be done without creating an account, depositing funds or trusting Ethfinex. The next month will see our focus return to adding support for groundbreaking Ethereum projects demanded by the Ethfinex community, cementing Ethfinexs position as the home of Ethereum trading. If you are interested in the addition of a specific Ethereum project, don’t hesitate to share your thoughts on Reddit or Telegram, or reach out via our Token Listing form.